I’ve noticed that God has been speaking to me rather a lot about water lately – maybe because it’s 42 degrees outside! 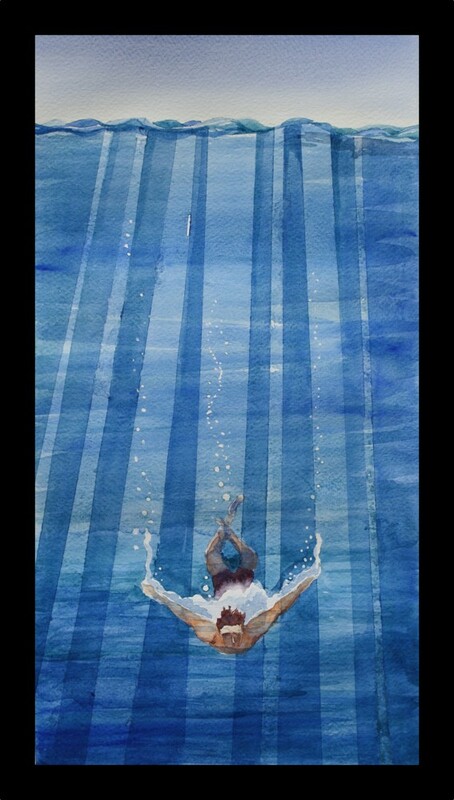 So the postcard for this week is about is choosing to swim in the sea. When it’s hot out, everyone wants to get into the water. Being able to safely immerse yourself in water is a massively important survive-the-summer strategy so everyone wants their kids to be able to swim, and the queues of traffic outside the teaching pools are quite something. If we want to survive the hot seasons of our lives, learning how to (and then choosing to) immerse ourselves in the presence of God is vital. It’s sensible that we learn to swim in the safe, shallow confines of a teaching pool. There are no unsettling waves, no unpredicatable currents and the water doesn’t hurt your eyes as much! You don’t even actually need to swim as you can stand in the waist deep water and wade to the safety of the side. There are times in our lives with Jesus that are like the teaching pool: We spend time learning the basics, gaining ‘water-confidence’, learning to trust that the water will hold you if you lean back into it. We start out here, and there have been quite a few moments in my walk with Jesus where I’ve realised that I’ve been ‘sent back to the teaching pool’ to learn something new, or to unlearn and relearn something I hadn’t quite understood the first time around! It’s a place to learn, but once we’ve learned we quickly outgrow it. The fun pool is easy and entertaining. There are safe borders but a limited space and it’s impossible to escape the noise and distractions. It is possible to learn new skills here- diving, handstands, water-polo, but it’s easy to just pop in and out of the water for a while and spend a lot of the time sitting on the side watching. There’s nothing wrong with spending some time here, especially when you are tired and in need of a break… but it’s a limited place. For me, just as there is nothing quite as wonderful as swimming in the sea, there is nothing quite like swimming out in the open water of faith and dependence on God. When I swim in the sea I have a tremendous sense of freedom and of being supported, held up, by the water. It’s true that there are patches when the sea is rough, when it would be nicer to have stayed in the safety of the pool. It’s true that you’re never entirely sure what’s under your feet. And it’s true that it’s pretty hard to swim without getting your hair wet! It’s not as predictable and easy as the pool, but also much more full of possibilities. If the water is the presence of God, then he is inviting you and I today to dive deep. I hear him calling us to trust that he is good; to not fear being immersed and overwhelmed, but to know that we will find ourselves able to breathe underwater. So here’s the invitation: Come and dive into this quiet place, where the noise of the world is silenced and where everything is coloured by the light of his presence. What are you hearing God say? What pool are you in right now? What is good about it? What are the challenges? How do you feel about the invitation to dive deep into God’s presence? What would stop you? What would be the first step for you to push in deeper into relationship and friendship with God? Is that Andrew in the picture? Nice one. haha. No, this time I needed to find some source pictures on the net taken with underwater cameras… Surprising how often I do make my family pose to get figures looking ‘right’ though!